Have you ever been to a butterfly sanctuary? The little winged creatures are all around you, fluttering like silk angels. You have to look down when you walk lest you step on them. They light on your hair and clothes. It is a most awesome experience. Besides being beautiful to look at, butterflies are beneficial to our environment. They pollinate our flowers as they feed on nectar. A bit of careful planning for the right environment and you can say "Welcome" to butterflies no matter what part of the world you live in. Butterflies prefer to lay their eggs in meadows and open areas. Driving through South Dakota last year we saw millions of little white butterflies along the roadside sipping nectar from the native plants growing wild. Interestingly enough, butterflies love the plants we tend to think of as weeds: milkweed, nettles and thistles, not the plants one normally has their yard. Don't despair, however, they also love many of the flowers and trees we already have readily available. Butterflies look for two types of plants: nectar and host plants for caterpillars. Listed below are some plants for both categories but before you rush out and buy the plants read on for some tips to make your yard friendly to butterflies. Butterflies live and flourish in open sunny locations. The truth is, they can't really see very well in the shade and so they avoid shady areas. They do like trees and shrubs and will seek shelter from the wind and rain under leaves. This is also where butterflies spend the night, in case you ever wondered. Butterflies also avoid windy areas. Shrubs and grasses are natural windbreaks and are beneficial if you live in a windy location. 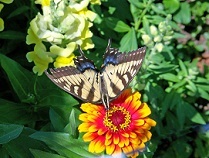 Water is an important component in a butterfly friendly garden. They like to sip water in between sipping nectar. Something as simple as a shallow dish filled with small rocks or pebbles and water will suffice. Butterflies like to "hang out" at mud puddles. Make one by digging a shallow hole and lining it with plastic. Fill it with soil and some composted manure. Plant some of the flowers they love around the puddle, and butterflies will surely feel at home. Remember that insecticides you use to kill the pests in your yard will kill caterpillars and butterflies just as efficiently. Unless you have a severe insect problem, resist spraying or laying out poisonous bait. Spiders and birds have their own way of handling some of the unwanted bugs. And if you feel you can tell the difference between a cutworm and a monarch caterpillar, try handpicking intruders and disposing of them away from the yard. Planting a butterfly garden means sacrificing some of your plants. After all, caterpillars need to eat. Set out some plants just for the caterpillars and some for you. 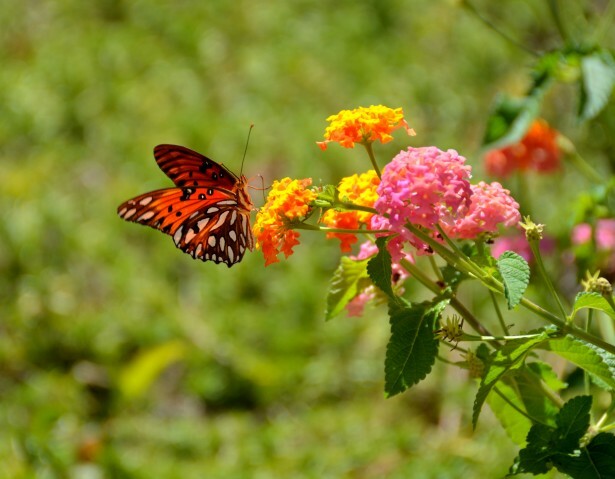 Try some of these flowers, shrubs and trees in your yard to attract butterflies. The host plants will encourage your butterflies to lay eggs so the caterpillars will have food. This will hopefully result in a new wave of butterflies the following spring. Article Source/Author: eSamet Bilir is a hobbyist gardener and landscaper with more than 10 years of experience in vegetables gardening. Among other projects, he is co-owner of gardeningandlandscapedesign.com, a great website to learn how to start a garden with subjects like: home vegetable gardens, raised beds and container gardening, butterfly gardening, herb and flower gardening and many more. An instructional video with a bunch of butterfly gardening tips and useful tricks. An article with helpful advice for gardening to attract butterflies including common caterpillar food sources. Enclosed structure surrounds garden beds. Plants inside the structure attract butterflies. Openings on the top and sides invite butterflies in! Gives kids an up-close view of the whimsical creatures.